The Asfur Angelfish (Pomacanthus asfur) is also known as Arabian Angelfish and Crescent Angelfish. Pomacanthus asfur has not been evaluated for the IUCN Red List of Threatened Species. The Asfur Angelfish is found in the Western Indian Ocean, including the Red Sea. Its native range stretches from the Red Sea and the Gulf of Aden down to Zanzibar. This fish is typically found in semi-protected inshore reefs with prolific soft and hard coral growth, but it can also be encountered over patches of silt bottom. It is a non-migratory species with a depth range of 3-30 meters /10-100 feet. The Asfur Angelfish lives singly or in pairs. It is very aggressive towards other members of its own species (except for its mate). The largest scientifically measured Asfur Angelfish was 40.0 cm / 15.7 in. Juvenile specimens have blue bodies decorated with light-blue and white stripes. They can be confused with Koran Angelfish (Pomacanthus koran), but the Asfur Angelfish features three (predominantly) white bars. As the juvenile ages, it will develop yellow markings on its dorsal fin and the caudal fin will also turn yellow. 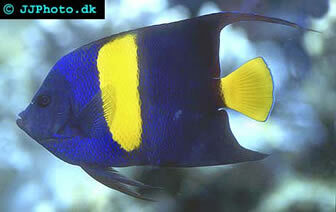 The adult Asfur Angelfish has a dark blue or dark purple body with a black head and bright yellow tail fin. Just as the name Crescent Angelfish suggests, a yellow crescent bisects the body vertically. As an adult, the Asfur Angelfish can be mistaken for Maculosus Angelfish (Pomocanthus maculosus) but Maculosus Angelfish doesn’t have a bright yellow non-transparent tail. The Asfur Angelfish is considered difficult to keep since it feeds on sponges in the wild. You can find more information about feeding further down in this article. It is not recommended to house Asfur Angelfish in aquariums smaller than 100 gallons / 375 litres. It is important to include a lot of hiding spots in the aquarium and live rock suitable for grazing. This species is considered reef compatible with caution. It likes to nip at stony corals, soft corals and clam mantles, but will usually leave small-polyped stony corals and somewhat noxious soft corals alone. The Asfur Angelfish is a fairly shy and peaceful species that can be housed with other peaceful fishes, with some exceptions. In the wild, the Asfur Angelfish is found singly or in pairs and keeping more than one specimen of this species in the aquarium is not advisable unless it is a compatible pair. It will not only be aggressive towards its own species, it will attach other large angelfish as well. Keep the water temperature in the 72-78º F / 22-25.5º C range, the specific gravity at 1.020-1.025, and the pH-value from 8.1 to 8.4. In the wild, the omnivore Asfur Angelfish feeds chiefly on sponges, tunicates and small amounts of algae and it is advisable to provide it with this in the aquarium as well. It will also nip at stony corals, soft corals and clam mantles. It is better to give your Asfur Angelfish many small servings of food throughout the day than just one or two big meals. The Asfur Angelfish is an egg-laying species that will scatter the eggs. All known marine angelfish species are protogynous hermaphrodites. All Asfur Angelfish specimens begin their life as females, but have the capacity to change into males when they grow older.